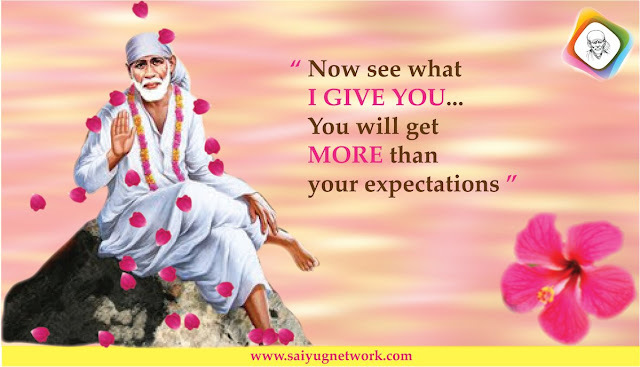 Shirdi Sai Baba Devotee Sangeetha says: Om Sairam to all Sai devotees. I am a part of MP- 234 & AASM also. I extremely feel blessed by our Saimaa that He has chosen me as a part of this holy Mahaparayan group. Coming to today's experience (24th July 2018). All of sudden I got a call from my brother that my sister- in-law was not feeling well. My brother and sister- in-law are blessed with a baby after 7 years of their marriage. She had previous miscarriage. Now she is 6 months pregnant. All of sudden she didn't feel any movement of baby for past three days. Everyone got scared because of previous miscarriage. I immediately went to our Sai Maa and cried for help and prayed to bless both mother and baby. I messaged MP-234 and AASM group as it was Tuesday our turn to do Sai Jaap. All kind-hearted Sai devotees prayed for mother and Baby's health. I even started to read Stavan Manjari. When I was reading also’ in my mind I remembered about Tatya’s death and how it was taken away by Baba in chapter 42. I was getting same thought that same way Baba will wash away all our sins and past karmas and bless my sister- in-law and the baby. Within next 1/2 hour I got a call from my parents and they did scanning. By grace of our Saimaa both mother and baby were absolutely healthy. Immediately I thanked Sai and all Sai devotees in the AASM and MP group. Om Sai ram stay with mother and baby throughout pregnancy and afterwards also. Bless all! Secondly You know what I am going through in my job. Please help and save me from any embarrassing situation, You know very well about my sincerity and straight forwardness in my job. Due to this some enmity has come with higher official. Even when they insist to do wrong I disagree, please help me to come out of this situation. They are trying to terminate my contract by all possible crooked ways but I blindly trust You Sai. Save me from difficult situation and same time You know how important this job is for me. I don't want my kids and family to be distributed at this crucial year as my son is doing his 12th grade. I want complete peace at home. So by Your grace He will concentrate on his studies and secure good academic results by Your grace. Please Baba help and bless my family and me and save us. Completely surrendered at Your holy feet. Why fear when we have Baba’s hand over us every moment? He will do only what is best for us. So let’s surrender completely to Baba without giving up on our efforts because God also helps those who help themselves. Love You Deva. Jai Jai Ho Sai. U r already blessed .jisko sai rakhe usko kaun change.dont worry sai will bless ur child a great future n to u a nice job .